Are you struggling to acquire more customers for your business? I have consulted themed attractions, B2B businesses, education providers, consultancies & retail outlets, all these businesses have the same challenge of acquiring more customers. Here are some customer acquisition strategies I learned from my experience working in the marketing and advertising industry. For years, companies have structured their business strategies around the marketing funnel. But recently, the marketing funnel has begun to fail marketers, salespeople, and business leaders alike. The marketing funnel has one major flaw: It views customers as an afterthought, not a driving force. Today, with the rise of social media customer referrals and word-of-mouth have become the largest influence on the purchase process. Let me introduce you to the Flywheel model, invented by James Watt. The flywheel is simply a wheel that’s incredibly energy-efficient. The amount of energy it stores depends on how fast it spins, the amount of friction it encounters, and its size. With the flywheel, you use the momentum of your happy customers to drive referrals and repeat sales. Basically, your business keeps spinning. With the flywheel model, every team in the entire company has the responsibility to attract, engage, and delight customers. When all of your teams are aligned, you can provide a more holistic, delightful experience to anyone who interacts with your business which in turn acquires more customers for your business. According to Hubspot, companies that choose to use the flywheel model have a huge advantage because they aren’t the only ones helping their business grow — their customers are helping them grow as well. Word of mouth marketing has made its name as a buzzword since marketing began. However, almost every buying decision is influenced by word of mouth, but few companies have an actual strategy in place to drive customer conversations around their business. Here is a classic example of word of mouth marketing is by a 100-year-old brand, Hilton Hotels & Resorts. Hilton differentiates its Doubletree brand by welcoming guests with a warm chocolate chip cookies, baked fresh daily. The warm chocolate chip cookie delivered by hand personifies Hilton’s constant dedication to their guests and thoughtful touches that ensure their guests feel special and cared for throughout their stay. this shift, purposefully crafting differentiators that get customers to tell authentic, visceral, trusted stories about the business and its products or services; stories that create new customers through referrals and recommendations.” You can get a step-by-step guide to acquiring more customers with word of mouth in Jay Baer’s book, Talk Triggers. A great way to create a sustainable customer acquisition channel is through content marketing. Once you rank for strategic keywords on search platforms, you will reap organic traffic in the long term. There are roughly 1.8 billion sites on the web, roughly 1 billion of them are blogs. For that reason, it can be hard to get your content to rank for certain keywords. “It’s not just about backlinks or optimizing your on-page code, it’s about providing what’s best for the end user,” says Neil Patel. Google is now looking to rank for rich and well-researched content. This means creating content with strategic references and useful information. One example is how I ranked no.1 (depending on your location) for “skills to learn in 2019”. When creating content, you can also use the Content Sprout Method by Single Grain. Content sprouting is the process of creating a great piece of content know as a ‘seed’ and using it to sprout new forms of content. For example, you can create a Youtube Live video. Then, you can create 3 or 4 Youtube videos from the topics in the Live video. These videos can also be posted natively on LinkedIn. You can scrap the audio and publish it as a podcast. Lastly, you may transcribe the Live video and make it into a blog article. As you can see all the content originated from the one piece of content from Youtube Live. If you are looking for an effective way to utilize your marketing budget, an affiliate program or strategic collaborations are the way to go! Why waste time acquiring new customers when you can leverage third-party subscription or customer databases that are non-competitive but in the same vertical. For example, a sports nutrition brand could collaborate with a gym to upsell their nutrition to the gym members and vice-versa. Alternatively, you can leverage on online publishers’ email subscriber list by sponsoring emails to their email subscriber list, check-out paved.com & sponsored.tech to find relevant publishers. Content volume is exploding today, the number of channels brands need to engage their customers on is constantly changing. If you are reaching out to clients or customers in multiple countries, you might want to consider localization. Language localization is the process of adapting a product that has been previously translated into multiple languages to a specific country or region (from Latin locus (place) and the English term locale, “a place where something happens or is set”). Localization is important for the cultural context of your content to account for differences in distinct markets. As an example, international speaker Gary Vaynerchuk localizes his content in multiple languages including, Chinese, Spanish, Portuguese and many other languages to have a bigger impact on his audience in different countries. If you are driving tons of traffic to your website, you need a strategy to increase conversions! Here are three tips to increase conversions on your website. Embedding a Youtube video humanizes the user experience of your website. Customers are more likely to convert when they engage with video content. Besides that, when a user spends time watching the video, it increases the time spent on a site, which helps with SEO! Tops sites like Amazon & eBay include reviews on their landing pages. You can do this too by collecting testimonials from your existing customers. Customer testimonials are that they significantly contribute to customer’s purchasing decisions, one study found that when asked how important reading online reviews were before purchasing a product, 38% of respondents answered “very important” and 19% responded “extremely important. Don’t let your website traffic go to waste! Chatbots are able to collect and archive information about a customer every time they interact with your chatbot. A chatbot personalizes the experience each unique customer receives as if they are being talked to by real human beings. Kia Motors America saw immediate success equal to three times the conversion rate seen on Kia’s main website (21% compared to 7%) when they deployed a Facebook messenger chatbot. Alternatively, you can also deploy conversational marketing software like Drift & Intercom. 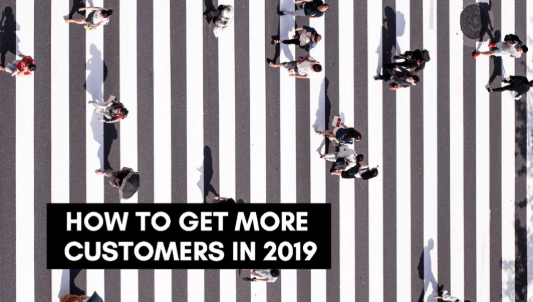 These are my 6 tips to acquire more customers in 2019! Let me know if you have any questions on how to get more customers in the comments below!